The first decade of the 20th century was exciting both from architectural and engineering standpoints. Steel skeletons made higher buildings possible and passenger elevators made them feasible. Suddenly Manhattan’s financial district was falling under the shadows of skyscrapers. But the skyscraper was here to stay, and the Trust Company of America was about to add one more. 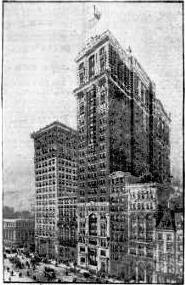 On May 20, 1906 the New-York Tribune reported that the financial institution was demolishing the 25-year old United States Bank Building at Nos. 41 and 43 Wall Street as well as its next door neighbor, the Metropolitan Trust Company at Nos. 37 and 39. The newspaper was amazed that the soaring 10-story building was already being razed for a yet taller structure. “On the site of the two buildings the Trust Company of America is to erect a twenty-five story skyscraper,” it reported. The cost of demolition alone would run $12,000. Four months later architect Francis H. Kimball completed his plans which promised “a new skyscraper, which will surpass in many respects anything yet seen in this city,” said The Tribune. The Trust Company of America would take the first floor and basement; the main floor being the banking department. “The banking rooms on the first floor are expected to be the most magnificent and elaborate offices in the city,” said The Tribune. The white marble base exploded in ornate Beaux Arts decoration. Above the central opening, two cherubs held a garland that draped down both sides of the window frame. Carved lions heads, scrolled brackets, fruits and flowers dripped from the façade. Above, the red brick central shaft, which showed more restrain, was interrupted by an interesting six-story bay. The uppermost floors returned to white marble sheltered by an overhanging cornice. Kimball and the Trust Company of America added one especially novel concept. The Mills Building, a 10-story structure at No. 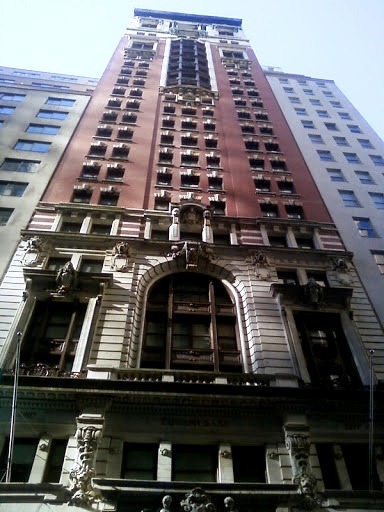 15 Broad Street, was L-shaped, with a portion of the building at No. 35 Wall Street. The offices were cramped and outdated. As the new skyscraper arose, entrances were opened at each floor that connected the two buildings, allowing the tenants of the Mills Building larger spaces. On December 16, 1906, six months into construction, an explosion below street level rocked the site. “With a crash which could be heard for blocks and which was followed by the blowing off of steam, more than seventy-five feet of asphalt covered street in Wall street between Nassau and William streets, sank from three to eleven feet yesterday afternoon,” reported the New-York Tribune. The building was completed in 1907 and along with the Trust Company of America financial concerns like Eyter & Co., dealers in high-grade bonds; and Shoemaker, Bates & Co., publishers of the Weekly Market Review moved in. The year would be momentous for the Trust Company of America for another reason. In October of that year a failed attempt by brothers Otto, Augustus and Charles Morse to corner the market in United Copper Company sent Otto Morse’s brokerage house, Gross & Kleeberg, into bankruptcy. When United Copper collapsed, the State Savings Bank of Butte Montana became insolvent. Because the Montana institution was a correspondent bank for the Mercantile National Bank in New York City, depositors panicked and mobbed the bank. Runs on other banks ensued. Within the week crowds were swarming the Knickerbocker Trust Company. The New York Times wrote “as fast s a depositor went out of the place ten people and more came asking for their money.” After three hours and $8 million in withdrawals, the Knickerbocker shut its doors. And now the panic spread to the Trust Company of America. The government supplied an influx of cash in the form of $8.25 million in loans to allow the Trust Company of America to stay open the next day. It was the first step in the process that within a few days staved off a financial collapse. Along with financial firms, legal offices filled the building. 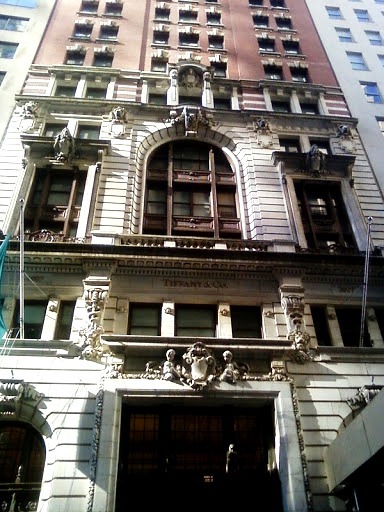 In 1908 Murray, Prentice & Howland, specialists in banking law, moved in and would stay for decades. By 1914 Blandy, Mooney & Shipman, attorneys, was here. In 1918 Equitable Trust Company took over the banking rooms of the Trust Company of America. By now attorneys Murray, Prentice & Howland had become Murray, Prentice & Aldrich. Perhaps their most visible and wealthiest client was John D. Rockefeller. In 1921 the attorneys were in Federal District Court fighting a governmental suit against the millionaire for $292,678.78 in unpaid income tax going back to 1915. Four months before the onslaught of the Great Depression, the Interstate Trust Company opened its headquarters here. In was one more in a string of banking firms that would use the cavernous first floor as their headquarters. In October 1941 the Public National Bank and Trust Company opened here, and in 1959 the Bank of Nova Scotia Trust Company of New York began operations. In the meantime, in 1954, the New York Institute of Finance moved in. The unique school provided education in securities markets. “At the start in 1921 it was solely for Exchange employees,” explained The Times on September 12, 1954. “In 1930 employees of member firms were admitted and in 1938…the public was admitted. In 1946 it had 1,200 students, the peak thus far.” Instructors in the Institute were mostly partners in Stock Exchange firms. In 1963, in an act reminiscent of Francis Kimball’s original design, the United States Trust Company broke through three floors to connect and enlarge their offices at 45 Wall Street. The Trust Company took a long-term lease on three floors of No. 37 Wall Street to seal the plan. Four years later the main banking floor would change hands again. In 1967 it was announced that “Extensive renovations to provide modern trading floor and administrative offices for the NYCE are underway in the 25-story tower at 37 Wall Street.” The move lasted until the 1980s when Morgan Guarantee Trust Company moved in. Francis Kimball’s handsome building would undergo its most drastic change when it was converted and restored by architect Costas Kondylis. Renovated into 373 rental apartments, its residents enjoy a gym, lounge with pool tables and a screening room. Above is a landscaped roof garden. 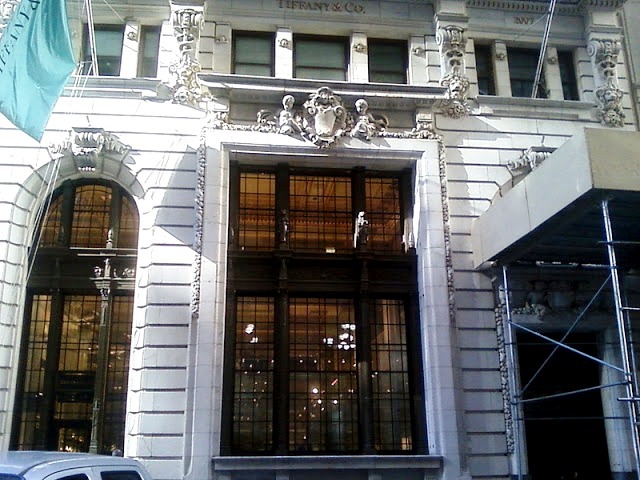 The great marble-walled banking room is now a 7,700 square foot retail space for Tiffany & Co. The jewelry store returned to lower Manhattan where it started out in 1837. 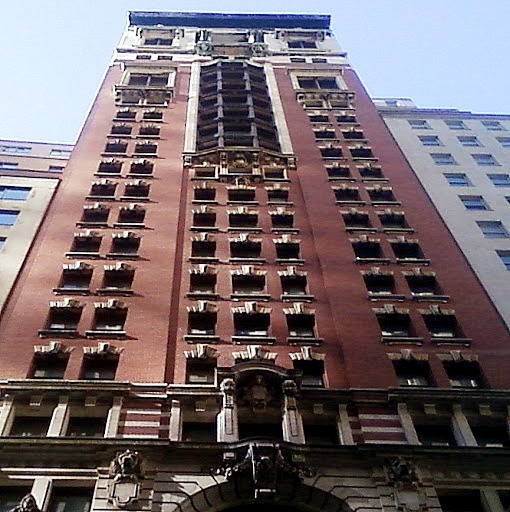 Kimball’s exuberant, lush façade remains untouched; although its 25 stories no longer tower above its neighbors.